Big Guy, Author at Big Guy Little Guy Promotions, Inc. Custom Guitars will Rock your Brand! Want to tell someone they Rock? How about a custom guitar?! Fully custom guitars make for premium swag in the promotional product industry. Check this out! Show your thanks in a big, bold and loud way with the loudest promotional gift ever! We all know music connects people everywhere, so why not connect people with your brand on custom guitars? Big, bold, and branded! Shout it out loud and proud with the loudest promotional product ever. Music is a universal language which your brand can use to connect to people everywhere. Do something new, hot, and fresh! 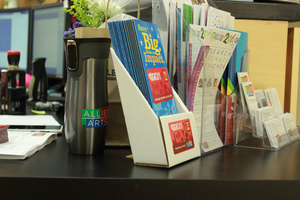 Premium musical promotional merchandise with your brand is a hit! Custom guitars, custom record awards, and custom ukuleles are unique and will connect your brand to your business players loud and clear. These custom guitars are not only perfect for the music industry, but they are a great conversation piece and look fantastic on display in any office! This full sized acoustic dreadnought guitar is well-built and affordably priced for the best promo value possible. Special attention is given to the neck angle to ensure that every guitar is intonated and playable. Martin strings are used to make this guitar even easier to play. This is by far the best acoustic guitar value that you will find, period! Available in black, red, blue and natural. You choose from your favorite guitar style! We have Fenders, Stagg Vintage-T, Peavey Rockmaster, AXL Badwater, Acoustic and many more! We even have custom Banjos, which are my personal favorite! When your company or event requires promotional merchandise with a high perceived value, an excellent choice for premium promotional merchandise is the Contigo drinkware line. Time and again we received requests from brands across the U.S. requesting the best quality in drinkware that their money can buy. These requests often include requests for the specific brand, Contigo. Companies, brands, and organizations that want quality want Contigo. 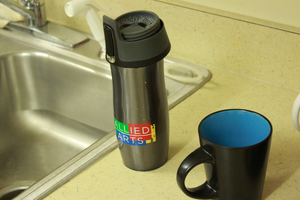 Those that do their research quickly find that the Contigo brand the best drinkware to co-brand with. BGLG Promos provides custom Contigo mugs, tumblers, water bottles, and shaker bottles that your customers, clients, staff, and fans will want to take with them everywhere they go. They’re perfect for travel, gyms, office, fitness, outdoor and recreation, churches, fundraising for schools and organizations, appreciation gifts, and excellent donor gifts. 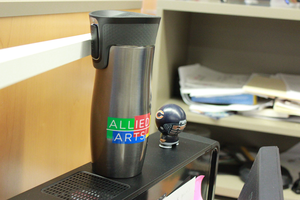 Check out these images from one of our clients who used custom Contigo West Loop tumblers as donor gifts. We printed a 5-color logo with tight registration and the product looked amazing. It was bright, colorful, and excellent quality. We love feedback and testimonials, especially with pictures! Thank you Allied Arts! 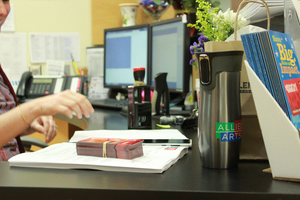 Make sure your check out Allied Art OKC! They are a fantastic non-profit organization supporting the arts in Oklahoma! Like them on Facebook! Follow on Twitter! And of course contact us to get your Custom Contigo West Loop and other Custom Contigo drinkware!